The spokesman for Nigerian President Muhammadu Buhari, has tweeted confirmation of the Chibok girls’ release, saying 21 of the girls kidnapped by Boko Haram militants have been rescued by the military. The girls, who have not been named, remain in the northeastern city of Maiduguri. In April 2014, over 200 girls had been abducted from their hostels at Government Secondary School, Chibok in Borno state in April 2014. As many as 57 girls escaped and shared harrowing tales of fleeing from the nearby Sambisa Forest, believed to be the terror group's stronghold. Dozens are still missing, and their whereabouts remain a mystery, but are believed to be somewhere in the forest. This is the largest group believed freed since the girls were kidnapped two years ago. 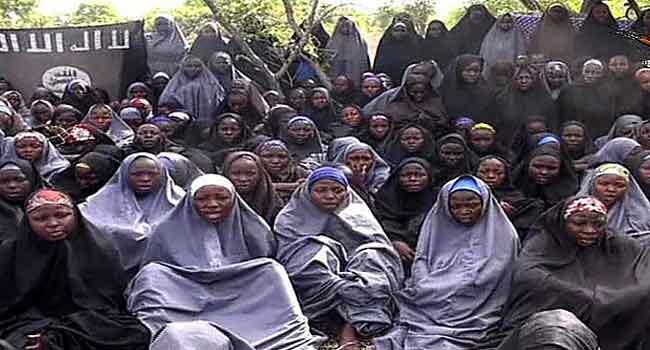 Since the abduction of the girls, pressure has been mounted on the Federal Government to rescue them, including demands for a swap with members of Boko Haram in detention. At the time, relatives roamed through the forest for days, frantically searching for the girls. The girls’ abduction had raised a world wide condemnation including the UN Secretary General, Ban ki Moon and U.S First Lady, Michelle Obama, culminating in the formation of the group, BringBackOurGirls, that have been at the forefront of pushing for the release of the girls. One of the abducted girls, Aminat Ali Nkeki was rescued in May 2016 during a raid on Sambisa forest by the military. Also in August, the terrorist group Boko Haram released a ‘proof of life’ video of the girls. The spokesman for Nigerian President Muhammadu Buhari, has tweeted confirmation of the Chibok girls’ release, saying 21 of the girls kidnapped by Boko Haram militants have been rescued by the military. The girls, who have not been named, remain in the northeastern city of Maiduguri. Dozens are still missing, and their whereabouts remain a mystery, but are believed to be somewhere in the forest. This is the largest group believed freed since the girls were kidnapped two years ago. Since the abduction of the girls, pressure has been mounted on the Federal Government to rescue them, including demands for a swap with members of Boko Haram in detention. At the time, relatives roamed through the forest for days, frantically searching for the girls. One of the abducted girls, Aminat Ali Nkeki was rescued in May 2016 during a raid on Sambisa forest by the military. Also in August, the terrorist group Boko Haram released a ‘proof of life’ video of the girls.